And sent to their Pa at Marseilles. 1. Heat 1/4 cup of olive oil in a large (6-8 quart) pot on medium high heat. When the oil is hot, add the onions, leeks, and fennel. Stir to coat the vegetables with the olive oil. Cook on medium heat until softened but not browned, about 10-15 minutes. Add the crushed garlic, chopped tomatoes, bay leaf, thyme, saffron, salt, and orange zest. Cook until the tomatoes are soft and broken down, about 10 more minutes. 2. Cut fish fillets into 2-inch pieces. Bring 2 cups of water to a boil. Lay the fish pieces over the vegetable mixture and pour over with 2 cups of boiling water. Bring everything to a boil, and cook, uncovered, for about 5 minutes. Add the mussels, squid, and/or crab, pushing aside the fish so that the shellfish is now covered in liquid, and boil for 10 minutes more, uncovered. Remove the bay leaves, sprigs of thyme, and orange zest. Add freshly ground black pepper, and more salt to taste. 1. Put hot fish stock or clam broth into the bottom of a blender. Add garlic and red hot pepper and red bell pepper, salt and bread. Blend until very smooth. With the blender still running, add olive oil slowly and stop the blending as soon as the oil disappears. 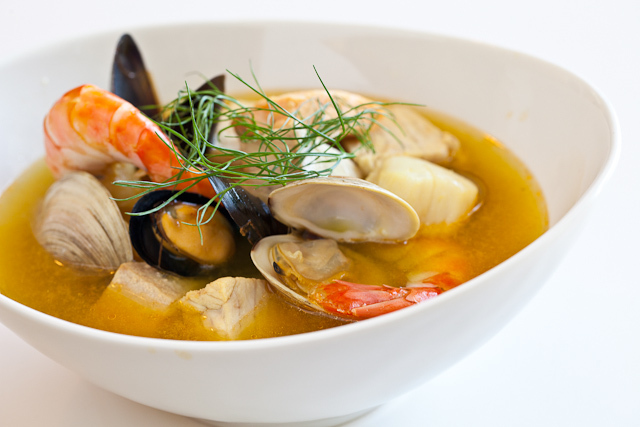 At serving time pass Rouille in a little bowl along with the bouillabaisse. Each serving is about 1/2 a teaspoon that you stir into your soup. Use gingerly like Tabasco. Wow thanks. That’s the best compliment ever. I’m not sure how blog-aholic works either, but I’ll read up on it.